Arrange carrot, cheese slices and raisins in the center. Roll up the chicken meat tightly, fasten with toothpicks and pan fry. When the chicken turns brown, remove from heat and set aside. (Once the chicken has cooled, remove the toothpicks and discard). 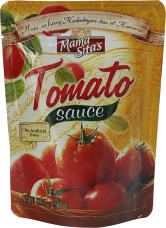 In the same pan, sauté onions until soft, add the Mama Sita’s Menudo Sauce, Mama Sita’s Tomato Sauce, chicken and water. Cover and simmer for another 15 minutes or until the sauce has thickened and the chicken is cooked through. Remove from heat and serve.